Ward Black Law is pleased to announce that attorney Gerard Davidson was awarded the Lifetime Achievement Award from Habitat for Humanity’s Greensboro Affiliate in February 2016. This award recognizes years of dedication and service to Habitat for Humanity and the city of Greensboro. In addition to honoring him with the award, the organization’s Board has decided it should officially bear his name. Future recipients will be honored with the “Gerard Davidson Lifetime Achievement Award.” The legal team at Ward Black Law is proud of his accomplishments — both as part of our firm and a member of the Greensboro community. 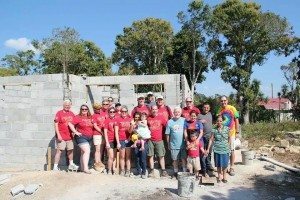 Gerard has volunteered with his church, as well as with many nonprofit organizations across the Triad, but he considers Habitat for Humanity his true passion. That passion was sparked when he first heard about the organization over two decades ago. Shortly after, he joined the organization’s roof truss crew, realizing that hard labor brings great reward. The skills and knowledge that Gerard developed through his work with Habitat for Humanity have impacted lives far beyond Greensboro city limits. His heart for the country of Honduras has led him to Central America 19 different times. In poverty-stricken areas, he had the opportunity to minister to adults and children through both physical labor and spiritual guidance. For over 37 years, Gerard has been practicing law in the city of Greensboro, focusing on personal injury and products liability litigation. In addition to his legal career, Gerard served as an Adjunct Professor at Wake Forest School of Law for six years, teaching pretrial practice and procedure. He has also served his country in the United States Army as a Captain in the Judge Advocate General’s Corps (JAGC), prosecuting and defending soldiers in Courts Martial. Ward Black Law hopes Gerard’s commitment to service is reflective of our firm’s deepest values. In addition to providing exceptional client service, it is our priority to utilize the various skills and talents on our team to make this community a better place. If you are in need of a local attorney who is experienced and compassionate, contact us today.